Taian hotels: discount reservation system offered by chinahotelsreservation. Taian new information: all your requirements regarding your stay, included instructions about tours and convenient solutions for hotels and rooms arrangement. For detailed Taian hotel information or to reserve a hotel please click on Taian Hotels list. Tai'an is located in the middle part of Shandong, link with Jinan in the north, border on Qufu of Birthplace of Confucius in the south, border on Zibo of town of porcelain in the east , borders on the Yellow River in the west, the whole area is 7765 sq. 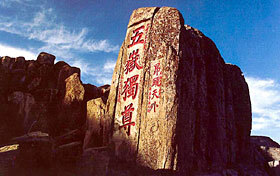 km., population is 5,330,000. 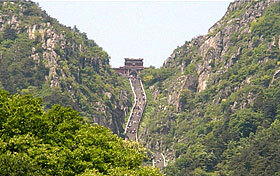 Tai'an is located in well known the south of Mount Tai. An organic whole of mountain city, the scenery is beautiful, culture is developed, it is a cultural city of scenery travel with a long history. Tai'an belongs to the moist monsoon climate of temperate zone, make a clear distinction between the four seasons, the rain and hot are in the same season , 13 degrees of average temperature of the whole year, annual average precipitation is 700-800 millimetres, it takes more than 200 days of frost-free period within the year. Give a recommendation scenic spot as follows, Mount Tai temple, Mount Tai workshop, Wang Mu Pond, the red palaces, fight in mother's palace, Jingshi valley, the pot day pavilion, South Tianmen, the cloud step bridge, five loose pavilions, South-Sky Gate, the green rosy cloud shrine, emperor carries the jade, Riguan peak, Sheshen precipice, father-in-law's peak , Confucius climbs the place .